Alison Pick is a Canadian writer of poetry and fiction who has now added memoir to her writing talents. Pick has published two books of poetry, The Dream World and Question & Answer, as well as two novels, The Sweet Edge and Far To Go. 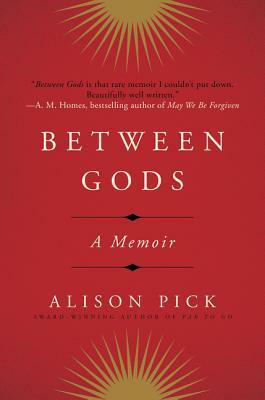 Her most recently published work, Between Gods, is a deeply personal story about how her discovery of family secrets led to a questioning of her spiritual identity. Between Gods is also an honest look at how living with depression affects daily activities, work, and relationships. It won a Canadian Jewish Literary Award for Biography/Memoir, was a Top Book of 2014 at the CBC (Canadian Broadcasting Corporation), and was shortlisted for the British Columbia National Award for Canadian Non-Fiction. Marianne Lonsdale telephoned Alison Pick at her home in Toronto, Canada, after finishing Between Gods the night before their conversation. They discussed differences in writing and publishing poetry, fiction, and memoir, and also Pick's observations on winning and judging literary awards. Marianne Lonsdale: You write in multiple disciplines—poetry, fiction, and memoir. Can you talk about your development as a writer? How did you start and how did you progress? 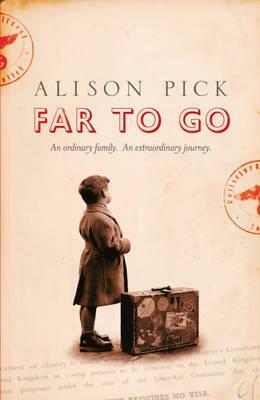 Alison Pick: I started late: I was not a kid who always wanted to be a writer. In my last year of undergraduate studies, I took a class in poetry and loved it. So I'm mostly self-taught. I've taken a few weeklong classes but I've mostly learned by doing. I first wrote a book of poetry and had it published. I wanted a bigger canvas so I tried my hand at a novel and found I really enjoyed writing the long form. Writing memoir came as a surprise. I was doing research for my novel Far To Go, a fictional story about a Jewish family living in Czechoslovakia when the Nazis invaded that country. I started keeping a separate notebook about how the research was turning up questions and facts about my own family, and I realized I had a second book, a memoir that became Between Gods. ML: Can you expand on what you learned about your family that you led you to write Between Gods? AP: My family practiced Christianity. We went to church on a regular basis. My grandparents immigrated to Canada from Czechoslovakia at the beginning of World War II, but did not tell their son (my father) that they were Jews who had fled Europe. Most of the family stayed behind and some were killed in the camps, including two children of my great-grandmother. My grandparents were scared to be honest about their Jewish heritage. A classmate of mine pointed out to me one day in the playground that Pick was a Jewish name. When I mentioned this to my father, he was evasive, and it turned out he hadn't even known of his Jewish heritage until he was a young man and visited the Jewish cemetery in Prague. Finding out that my family was Jewish cracked open identity issues for me. Between Gods tells the story of my investigation of my family history. But it's more than that—discovering I was Jewish felt true to who I was—it made emotional and spiritual sense to me. And I spent the next couple of years grappling with whether I wanted to convert to Judaism, and even if the synagogue at which I studied would accept me. I was engaged at this time, and my spiritual journey certainly complicated our relationship. That said, my fiancé was very supportive of my need to explore my spiritual identity and took conversion classes with me. ML: How have family members reacted to your memoir, Between Gods? AP: Overall the family reaction to my memoir has been positive. My father, who is a major character in the book, was delighted. One of my cousins opted not to read the book based on what she'd heard about it—she didn't feel it mirrored her experiences in our family. And that's just fine; I understand. One group of readers of Between Gods that's been a surprise is the number of adoptees I've heard from and met at readings. The search for identity, and the comfort and conflict that finding birth families can raise, pulls this group to the book. ML: You first wrote poetry and then fiction. How different is writing memoir? AP: Writing memoir was scary in some ways because it is so personal and I was discovering secrets about my family. However, the writing process is similar for both novel and memoir. Both are art, and the writer needs to make the same types of decisions: considering where to start, what to include, characters, and determining the arc of the story. Memoir is not a direct translation of experience. The writer does not make things up but does make decisions about what to include and what to exclude. I love the exercise of writing—poetry, fiction, and memoir all feel like using the same creative muscles. ML: Can you talk about your process for constructing a novel? For example, do you outline? AP: I am a big believer in outlines. When I first started writing, I heard an interview with Alistair MacLeod in which he talked about how a carpenter would not go in without a plan. That comment resonated with me. I spend at least a couple of months on the outline at the beginning of a project. Having an outline gives me confidence, and an outline can be very flexible and accommodate changes that develop during writing. ML: How has your writing changed since having your daughter six years ago? AP: My time is of course more structured and less my own, which can be frustrating. Some mornings it's hard to wrangle with putting a snowsuit on Ayla instead of being at my desk. But becoming a mother also made the world come alive in new ways. My empathy and compassion for others has grown and I certainly have improved abilities to write about parents and kids. ML: Can you talk about your path to being published? Have you had different publishing experiences with poetry, memoir, and fiction? AP: My publishing experience may be different from writers who try and try and try over a period of years. When I started writing late in my college studies, I knew nothing about publishing and had few expectations. I quickly found an agent for my first book of poetry and have been fortunate to still be with that agent. I've also had the same editor who I adore and have followed from press to press. Publishing poetry is very different from fiction and nonfiction, in that the audience is much, much smaller. It's really a labor of love. Publishing fiction and nonfiction has meant extensive touring, which I've been grateful to do. I love meeting my readers at various festivals around the world and hearing their feedback on the books. ML: You won the 2002 RBC Bronwen Wallace Award for most promising writer under the age of 35 in Canada. You also received the National Magazine Award for Poetry and the CBC Literary Award for Poetry. In addition, in 2011, your novel Far To Go was nominated for the Man Booker Prize. And this is just a partial list of awards and nominations you've garnered. What's it like to receive such significant critical acclaim? AP: Winning these awards has been very exciting. The nomination for the Man Booker prize came totally out of the blue. I was at our family cottage near Quebec, writing and intentionally not answering my phone. But then I saw my name come up several times on Twitter and curiosity got the best of me. I discovered I'd been nominated. Each award brings prestige and media coverage, which I hope leads to more book sales so that I can afford to keep writing. My goal is always more writing time. ML: And now you are in the position of judging literary works for awards. How is it being a judge? AP: Yes, I was honored to be on the five-member 2015 jury panel for the Giller Prize, which recognizes excellence in Canadian fiction, and comes with a financial prize of $100,000. I've learned that it's a lot of work! And that winning awards relies on talent, luck and who the judges are. ML: You've mentioned the need for uninterrupted writing time several times. On one hand, this seems like an obvious requirement for a writer, but on the other hand the pressure to build platform and media buzz takes up much of that time. How do you manage that pull? AP: Yes, building a platform has developed into a requirement for writers in a way that it was not ten years ago. I work hard at striking a balance. I am on Twitter and Facebook and speak to book clubs. I really enjoy connecting with readers—that's the most positive aspect of social media. But writing is my love and I keep my eye on the ball. And I avoid getting too caught up with tracking and reacting to reviews of my books. ML: Both of your novels, The Sweet Edge and Far To Go, were optioned for films. Any update on those stories getting to the big screen? AP: Film development on Far To Go is progressing and it's very possible that it may make it through production. I view the potential films as very distinct, very different from the books. AP: I'm in the early days of working on a novel and still finding my way. This book may be a literary murder mystery on a kibbutz in 1921. We'll see where the writing goes. Marianne- thanks for introducing me to a Canadian writer I am sad to say I was not fa,iliad with. I am heading ti the library to find her books. Very interesting interview.